The professionals’ experience shows that you may have a high-quality lawn when using fertilizers with controlled-release of nutrients, with NPK ratios adjusted to different seasons of the year. The most long-lasting fertilizer in the Garden Boom product line using POLYON technology gives the option of being applied just once a year to give nutrients to the lawn for the whole vegetation period. It’s suitable to apply it in spring. The fertiliser efficiency ranges from 6 to 9 months. The spring fertilizer with XCU technology starts up the lawn in spring months. The optimally-selected ratios of its nutrients support fast growth and development of the lawn. The fertilizer can be used also over the whole year to support its more intensive growth. The fertilizer can be applied from April to September, being active for 2 - 3 months. The summer fertilizer using XCU technology which has an equilibrated ratio of nitrogen and potassium for the lawn to optimally intake nutrients over summer months when the lawn is exposed to high temperatures. Its gradual controlled release helps the lawn be strong and healthy. The fertilizer’s efficiency lasts for 2 - 3 months. The fertilizer, using XCU technology, is primarily designated for autumn months. The selected ratio of its nutrients will help the lawn get ready for the winter season to increase its resist to winter stress conditions. 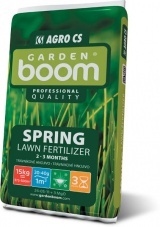 Applying the fertilizer influences the spring colour of the lawn to also faster involving the vegetation root system combined with using the spring fertilizer. The fertilizer’s efficiency lasts for 2 – 3 months. A high ratio of potassium can be used for additionally fertilizing the lawn in the summer season when there are high temperatures. The fertilizer is designated for establishing new lawns, regenerating older lawns and it is also suitable before installation of turf. The controlled-release of nutrients is provided using XCU technology with the adapted ratio of nutrients to support the root system growth and increase the regeneration of the lawn. The fertilizer’s efficiency lasts for 2 - 3 months. The technology comprises the use of packed controlled-release fertilisers allowing for gently-release of nutrients. The technology is unique because of using inside polymer jacket protecting the urea granule. The outside layer of the granule is encased with a thin layer of sulphur and that everything is covered by a wax layer with XCU green pigment. This structure of the jacket makes a consistent and more durable granule whose stronghold is important both when being made and when applied. In fact, its stronger jacket guarantees slower release of the nutrients for even 10 weeks. The activation and progressively releasing nutrients come up according to humidity and temperature. The technology of coated fertilisers provides for long-standing release of nutrients for several months. The technology uses the outside polymer jacket combined with green pigment protecting the urea granule. Once again, the jacket is activated by soil humidity, but further nutrient are released due to temperature without being influenced by humidity. Nitrogen is a nutrient important to generally support the lawn growth. The supply of this nutrient is important for the lawn from the beginning of vegetation till the beginning of autumn. The application of a fertiliser having a higher nitrogen rate should be limited in the autumn period. Alternative fertilizers should be used for this period with reduced nitrogen levels. Phosphorus supports the growth and development of the grass-root system. Choosing a product with high phosphorus is important for the germination of newly sown seeds or the regenerating of lawns. Regularly supplying potassium gives a high resistance and tolerance of the lawn to stress conditions, e.g. high temperatures in summer. A higher potassium rate is very important also when preparing the lawn for winter, as it helps strengthen the cells of the plant. Pottasium is also important in root development. It favourably influences the lawn colour and thus its aesthetical appearance and integrity. The fertilizer application differs according to the seasons of the year – spring, summer, autumn fertilizers. Long-lasting fertilizer is a good choice to have a top lawn. Each fertilizer has got its pre-defined dose. The optimum granule-size is 1 - 4 mm. The application time is ideally in the morning or evening hours because of the lawn temperature. Clayish soils have got other properties than sandy soils as for their permeability. A damaged lawn requires another nutrient ratio, generally changing the nitrogen and phosphorus ratio. 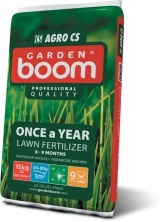 3 - 4 applications a year are enough when using long-lasting fertilizer. Your correct movement in the plot of land is important to minimise overdose. It’s a good advisor for whole-year maintenance.